Ode to the Hulk, a poem in green. 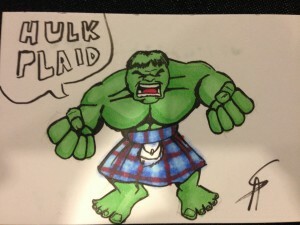 Was inspired by Alex's drawing the other day at WinterCon so I wrote Ode to the Hulk, a poem in green. Sure it's a bit whimsy and not actually a poem to rival Dylan Thomas, but fun is fun, and if you really look, there's another layer beneath. Also, if you like Alex's sketch, you can purchase his artwork from the Wayward Raven Shop or read Damn Heroes. You can find him as ASAPwasTaken on DeviantArt. If you like his work, throw him a few sheckles on Patreon. He's also open to commissions so if you have a an idea that you'd like to come to life, then you can contact him through our Contact page. Have a most wonderful day, night, today and tomorrow.